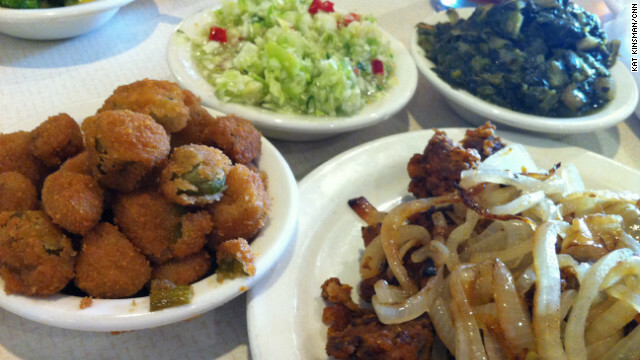 K&W Cafeteria now draws a multi-racial crowd -- but that wasn't always the case. How far would you go for a meal? Editor's note: This piece was originally published in the Southern Foodways Alliance's Gravy Foodletter #42, December 2011. Today's installment comes courtesy of Kat Kinsman, managing editor of CNN Eatocracy. Several stories above Manhattan's Central Park, there hangs a three-Michelin-starred, monstrously expensive restaurant that an awful lot of people think is perfect. I may have thought that, too, at one point, but I know it's not, because I've been to the K&W Cafeteria. Actually, I'm going to back that up and admit out loud in public that I have in fact boarded a plane, rented a hotel room, and stayed overnight in a city several states away for the express purpose of sitting down with a groaning tray of K&W chicken livers, fried okra, collard greens, and vegetable congeal and eating my greedy head off. Yes, I made some preemptory noises about going to visit a couple of old friends who live in relative proximity to a K&W. I brought them along with me so I could steal hush puppies off their plates. And their child's. I have no shame. And the trip cost just slightly less than my single meal at the aforementioned palace of gastronomic fanciness. There clearly are many, many things wrong with me as a human being, but if you've ever eaten at a K&W, you know my love of the place is not one of them. That wasn't always the case. Though a Sunday apres-church K&W dining room is now typically a multi-racial, transgenerational, pan-denominational assembly of Southerners possessed of a great appreciation for fancy church hats and rock-bottom prices, in the early 1960s, several outposts found themselves at the center of the battle over segregation. About the only healthy thing in that picture is the greens. After living in the South for the last 9 years and getting acute cases of GERD, IBS and bile from all the greasy, starchy, overcooked "comfort" (yuck) food fried in bacon tailings out of mason jars or slathered with overrich BBQ sauce that I sampled in my attempt to "assimilate" into Southern culture, I choose to stick to my simple ethnic staples of coffee, bread, cheese, whole rice, legumes, lean cuts stewed in vegetables and whole fruit, for my health's sake.